Last October, we participated in the Greater Milwaukee Foundation’s On The Table Initiative. 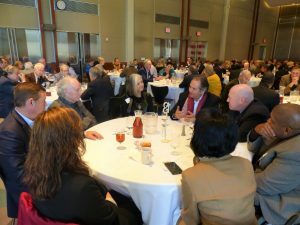 140 Rotarians and 80 guests were randomly assigned to 30 tables at our Rotary luncheon. We should foster stronger, connected communities and neighborhoods. So, let’s pick up where we left off—let’s explore the concept of fostering stronger, connected communities and neighborhoods, in particular in the Johnsons Park area. Let’s model, Connecting People and Resources Together for Common Good by participating in On the Table again on Tuesday, October 9th, 2018. So how will October 9th work? There will be no formal podium speaker; everyone will have the chance to participate in thought-provoking discussions about the Johnsons Park neighborhood. We plan to invite community members from the Johnsons Park neighborhood to join in on the conversations. Stay tuned for more information and mark your calendars to join us on October 9th!